Being as it was early in the morning and I wasn’t really awake yet, on this occasion I settled for adding a little ground, cinnamon, ginger and allspice to the coffee, and went back to bed. (I think I watched Nigella’s Kitchen on the iPlayer, in fact). It tasted only vaguely like I wanted it to, all the right flavours were there but there was no depth. As I neared the end of the coffee I could feel the graininess of the powdered spices. Not what I was looking for. I forgot about it completely for a couple of weeks until Winter hit us hard. One day we were watching the last leaves fall from the trees the next we were watching the snow fall and lie, inches and inches of the stuff. I worked from home for an entire week rather than risk taking my car out in the snow. Even after it started to thaw a week later I still had to get pushed out of my parking space. The snow had almost cleared when it started all over again. 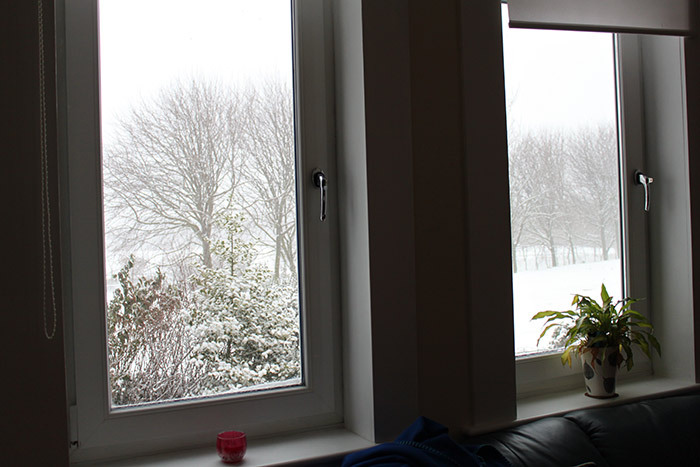 On Sunday when I was taking the photos for this post – this is what it was like outside. 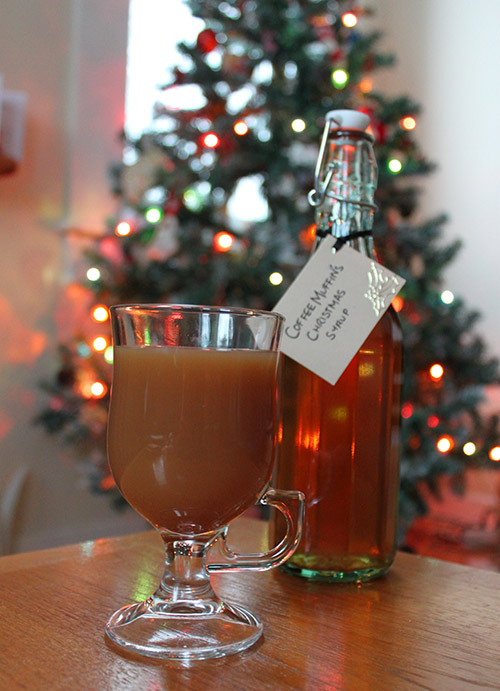 Anyway back to topic – with all the snow and the cold my mind kept coming back to a Christmas Flavoured Syrup, like the ones that you add over the festive season in coffee shops. This would allow me to get the depth of flavour with resorting to adding powdered spices. But I just couldn’t find a recipe anywhere. This is based on a recipe for a simple syrup like those used in cocktails, I used a 1:1 sugar to water ratio, because I don’t like my coffee to be too sweet. You can however use anything up to two parts sugar one part water (2:1). The list below is the spices I used in rough quantities, feel free to alter it as you wish. Place the sugar and water into a pan and heat gently until the sugar dissolves. Then add the cinnamon, ginger, all spice berries and cloves. Leave to simmer for 30 minutes under a low heat till it starts to thicken slightly and smell fragrant. Pour into sterilised containers (I cleaned a couple of mason jars in the dishwasher). 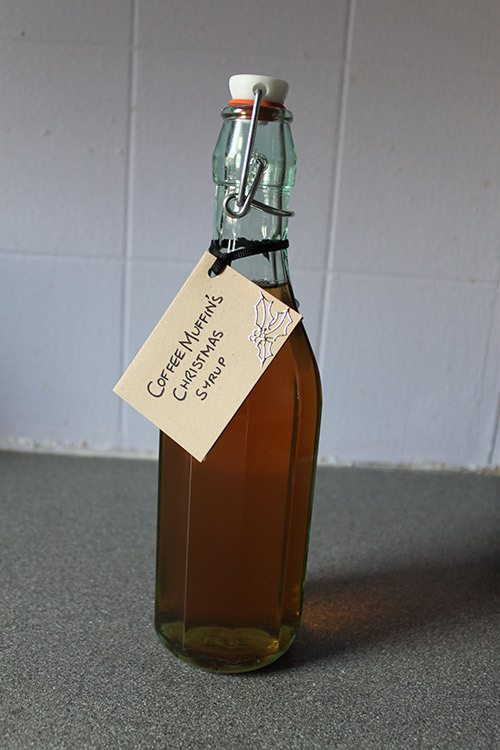 Leave the syrup with the cinnamon sticks, ginger etc for a couple of days to a couple of weeks. Before serving remove the spices and ginger and pour into a clean bottle. I use around a tablespoon per cup of coffee, although remember as you leave it longer the taste will intensify. I love this syrup as it is so versatile it’s great in coffees but you can use it in baking too, for anything that would benefit from an injection of sugar and spice. And at this time of year, lets face it, we could all do with a bit more sugar and spice.